Times are tough if one wants to write smoothly and precisely on a budget. 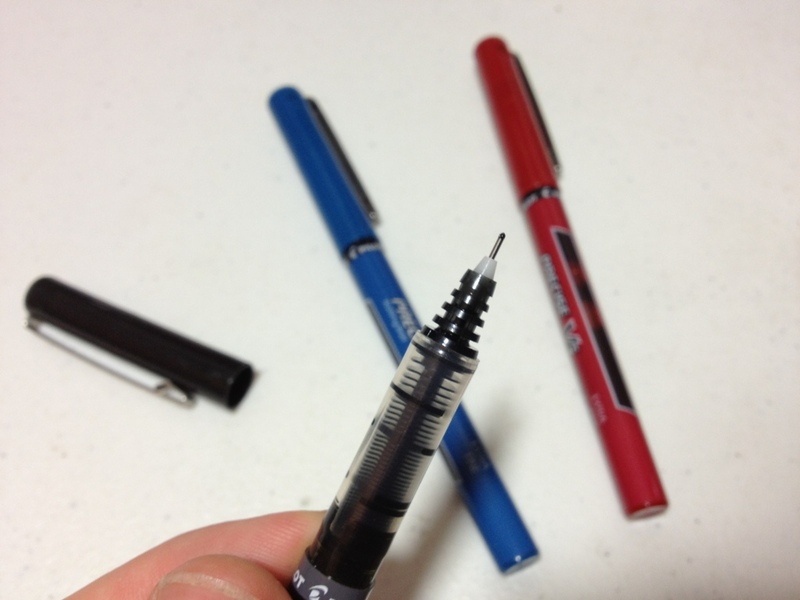 Technical pens wear out fast, and fountain pens cost money and time to maintain. I use both, but sometimes I just want to write easily and precisely without all of the maintenance and hassle. This is where the Pilot Precise series of pens come in. Today I’ll be looking at the v5 set in black, red, and blue. The cap and barrel are simple and straight. The cap has nothing on it but a simple metal clip that does its job well but can bend easily. The barrel has the necessary info about the product and an ink window so that if ink starts to run low you can get a general idea. Removing the cap shows a transparent section and feed system, which is more for being cool looking than any sort of functionality regarding ink level. At the end of the section is a series of plastic step downs that lead to a metal rolling ball tip. At the bottom of the section is a small clear plastic window that allows one to easily see if there is little or no ink left in the pen. The transparent section and barrel are both a slick plastic, but provide enough surface area that slipping off or letting go of the pen is not an issue. The tips of the pens write fairly smoothly. Older ones get a bit stiffer, but even on the extra-fine v5 they are never scratchy. The rolling ball delivers a nice “precise” line to the paper. Although it does have more variation than a technical pen in width, it has less than a standard ballpoint does, and it doesn’t blob. Like I said, writing is smooth: almost as smooth as a fountain pen, but not quite there. I’d say they are wonderful for writing (especially if ballpoints cramp one’s hands) but are not as good for drawing. Still better than a ballpoint, though. The three colors I have are Black, Blue, and Red: fairly standard colors with a fairly standard execution. The black is a warm black (this is an older pen, and Pilot may have changed formulas. The other two are brand new.) and noticeably less saturated than the thicker v7. The blue is quite dark, darker than most other Pilot inks, and quite work-appropriate. It’s almost a deep water blue, but not quite as dark as, say, Bic blue. The red is bright, bright to the point of being aggressive. Don’t grade papers with it unless you really want to say they’re wrong. 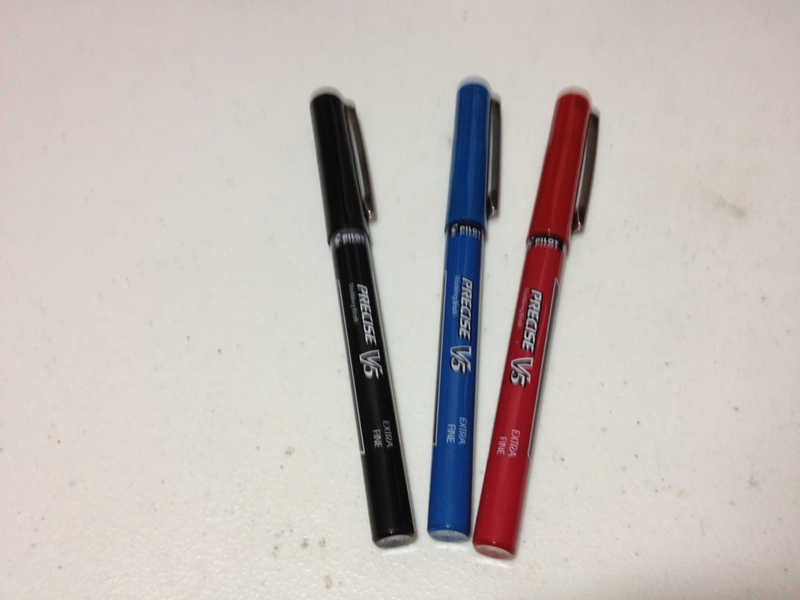 It shows up almost from across the room and is quite a contrast to the deep red body of the pen. I’d say it has the fewest practical applications of the bunch. All of these inks are liquid-based and soak into the paper, meaning that they take a bit of moisture to run, but when they do they never stop. The red is the worst in this case. In the end I’d say simply that these pens are great for writing, and all right for drawing. They aren’t the best but are great and ubiquitous for what they are. 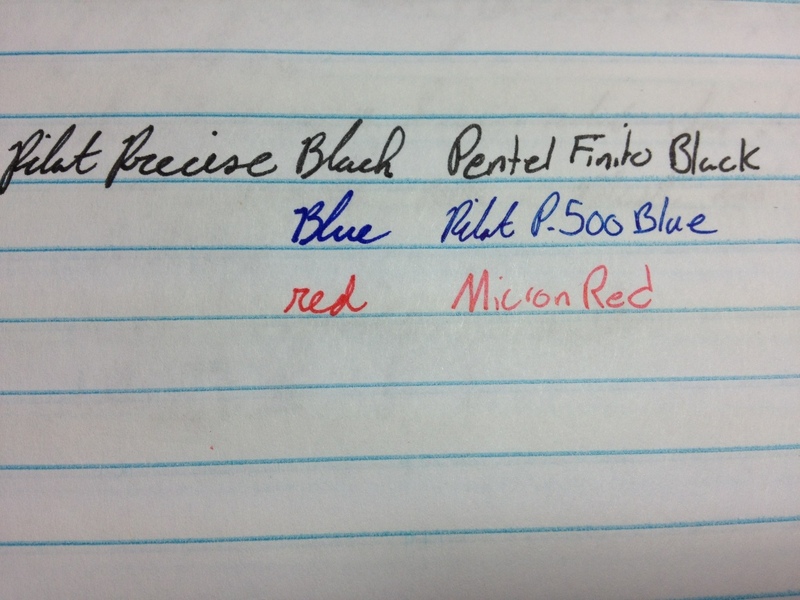 This entry was posted in Beginner Supplies, Intermediate Supplies, Utensils and tagged black, blue, color, p5, pen, pilot, pilot pen, pilot precise p5 pen, precise, red, review, rollerball by Dragon Co (Austin Smith). Bookmark the permalink.